Guide owners and editors can add blogs to their guides. This is a great way to share news and information about particular subjects, topics, collections, or disciplines. Blogs are truly interactive, too! Users with patron-level accounts can comment on your posts, allowing you to create a community of readers, scholars, and followers. You and your users can subscribe to the blog through email or with an RSS reader. There is no separate feed for the blog page; use the blog's main URL in your feed reader, and the feed will be detected. Please note: in order for users to see your blog's posts, your blog must be viewed over a secure HTTPS connection. For best results, we recommend that a LibApps admin set your LibGuides site to always load over HTTPS. While editing your guide, click on the gray Add New Page () tab. If you have a tabbed navigation guide, this will be the very last tab. If you have a side-navigation guide, this will be the tab at the bottom of the menu. Under the Create New Page tab, select "Blog" from the the Page Type dropdown. In the Page Name field, enter a title for your page. This is what displays in your guide's navigation menu and page heading. You can give your page an optional Description. 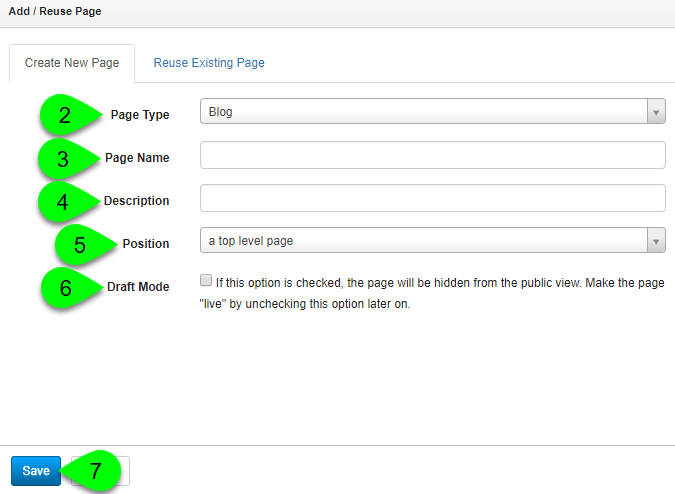 For the Position, select whether you want to add the page as a top-level page, or a sub-level page. A top-level page appears as a tab or side-navigation menu item. A sub-page is nested underneath a top-level page and will appear in a dropdown menu when hovering over that top-level page's tab. If you would like to hide this page from public view until its ready, select the Draft Mode checkbox. While enabled, you can only view the page while editing the guide. It will not be visible on the public guide, or while previewing the guide. Note: if your system has the Publishing Workflow (CMS-only) enabled, only a designated reviewer can take a hidden page out of draft mode.